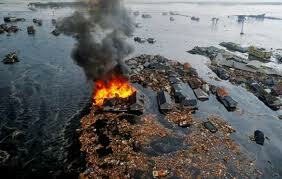 Japanese government regulators, [the Nuclear and Industrial Safety Agency] and the operators of the tsunami-stricken Fukushima nuclear power plant, [Tokyo Electric Power (TEPCO)] did not take precautionary measures in anticipation that a severe nuclear disaster could be caused by a tsunami such as the one that hit the nuclear power plant facility. This was the findings by an independent panel set up to investigate the events around the world’s worst nuclear accident, the first official probe into the March 11 catastrophe, had said. Japan had failed to think beyond the risks for which the nuclear plant was designed. The panel’s interim report sharply contrasted with TEPCO’s own probe, which said the utility could have had no way to prepare for the 9.0-magnitude earthquake and giant waves that sparked meltdowns and explosions at the plant. The panel said its aim was not to apportion blame for the disaster, but to learn why the accident happened in the way it did. The 500-page document, based on interviews with 456 people involved in the accident, comes nine months after the crisis forced the evacuation of tens of thousands of people as radiation leaked into the air, sea and food chain. TEPCO’s accident management program assumed only relatively minor internal incidents such as mechanical failures and human errors, the panel said. Risks such as ‘earthquakes and tsunamis were not included in the scope of consideration,’ the panel said, adding that regulatory bodies also failed to force TEPCO to establish thorough safety measures. The public’s mistrust in the government grew as Tokyo repeatedly stressed that despite nuclear explosions, health risks were low, the panel said. The government decided to withhold simulations of how radioactive materials from the wrecked plant could spread, while repeatedly playing down health worries. The panel also pointed to insufficient communication among government officials themselves, crisis management headquarters, headed by the premier, was launched in a fifth-floor while working level officials gathered at the crisis management center in the basement of the same building.